einer großen Falle gesteckt haben. Ich bin Präsident der Erde. Ich herrsche. Ihr habt mich gewählt, hähä. Achtung! Ich bin der König des Wagens. Der Wagen ist meine Waffe. Ich treibe alle vor mir her. Ihr sollt keine anderen Götter haben. Paßt auf! Ich komme durch. Ein dritter hebt den Kopf aus dem Sand. Ich leite eine Religion. Ich bin euer geistliches Oberhaupt. Ich schlage einen weiten Ball. Verbeugt euch und puttet. Ein Vierter hebt den Kopf in der Sandgrube. Ich bin der General. Ich habe Panzer um Wüsten zu erobern. Und meinem Panzer soll’s mangeln an nichts. Ich habe Durst. Wir spielen Rollerball. Ich liebe Araber. Ein fünfter hebt den Kopf und öffnet den Mund. Ich bin Die Stimme deines Herrn. Ich herrsche über die Presse; über Ätherwellen, lange & kurze. Wir biegen das Bewußtsein hin. Wir bringen die Realität in Ordnung. Satire wird Realität, Realität Satire. Der Mensch ein kosmischer Witz. Et cetera. Ein sechster Mann hebt seine goldene Glatze. Ich bin euer freundlicher multinationaler Bankier. Ich kaue aus Petrodollars gedrehte Zigarren. Wir stehen über den Nationen. Wir kontrollieren die Kontrolle. Ich fresse euch noch alle. Ich arbeite mit Margen. Euren. Eine Frau hebt den Kopf höher als alle anderen. der wie ihr Gatte wählt. Der mir die Brüste nahm. Eine letzte Gestalt steht auf, alle Schläger tragend. Halt oder ich schieße ein Loch in einen. Ich bin der Chef aller Polizei. Ich fresse Fleisch. Wir kennen den Feind. Besser ihr glaubt es. Wir beobachten euch alle, ihr Paranoiker. Los, lacht nur. Mit diesem Gedicht (ca. 1975) hat Lawrence Ferlinghetti die Gesellschaftskritik auf den Begriff gebracht! Kürzer & prägnanter geht es nicht. Gleichzeitig das Wissen (oder die Hoffnung), daß es diesen Freiheitsvogel Phönix gibt: Oft genug, wenn diejenigen, die die gesellschaftliche Macht einseitig an sich gerissen haben, und glauben sie könnten die Gesellschaft lückenlos kontrollieren und unter ihre einseitigen Vorstellungen subsumieren (die Gesellschaft verwalten), steigt jener Freiheitsvogel langsam aber stetig auf. Diese Erfahrung mußten ja auch die Kommunisten machen. Man denke nur an den Oberkontrolletti der DDR, den Stasi-Chef Mielke. Gerade die lückenlose Kontrolle durch die Stasi hat die Leute immer weiter aufgebracht gegen das System. Das Motiv des Freiheitsvogels tauchte übrigens auch bei der DDR-Rockgruppe Karat 1979 auf: bei ihnen ist der Albatros der Freiheitsvogel. 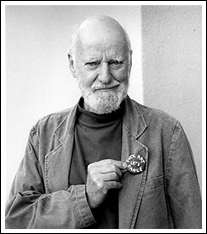 Lawrence Ferlinghetti is a poet, publisher, painter, and bookstore owner. Simple enough. Yet it seems almost larcenous [unehrlich?] to spell those occupations, in reference to Mr. Ferlinghetti, in lower-case type [Kleinbuchstaben]. As a poet, his A Coney Island of the Mind is considered a classic of the 20th century. As a publisher, his decision to produce Allen Ginsberg's Howl challenged the censors and ultimately reaffirmed [nochmals bekräftigen] our First Ammendment rights. As a painter, he continues to produce fresh, provocative, sensitively rendered [erbrachte] "statements" that convey [enthält] his message as much as any poem. And as a bookseller, City Lights is America's most famous bookstore ”a mecca for book-minded visitors from around the world. In early 2001 you wrote in an essay in the San Francisco Chronicle that poetry and freedom of speech were in big trouble. How bad are things now? Lawrence Ferlinghetti: Things are worse. Freedom of speech is always under attack by Fascist mentality, which exists in all parts of the world, unfortunately. What is "Skyscraper America"? Where is it found? "Skyscraper America" extends around the world with American corporate monoculture. There are skyscrapers in Sumatra, in China, in Japan, in the Middle East, in mid-Europe, in all the countries that were once under dictatorships. The first thing they do is rush to adopt the worst features of American corporate monculture: Skyscrapers, automobiles, the whole schmeer [der ganze Einheitsbrei]. In the wake of 9/11, do you envision any change in American consciousness? It seems to me it's changing for the worse. The spineless [rückgratlos] Democrats are taking dictation from George II who usurped the throne and is occupying the palace illegally. Hopefully [hoffentlich], we'll get to a boiling point... We've been at the boiling point for quite some time. September 11 was really the beginning of the Third World War, and not in the sense of World War I and World War II, but in the sense of the beginning of the war with the Third World. That's what it is. You were an active participant in WWII, and you saw Nagasaki after the blast. How did this contribute to who you became as an artist and as a man? Before I was at Nagasaki, I was a good American boy. I was an Eagle Scout; I was the commander of a sub-chaser [Untergrund-Jäger?] in the Normandy Invasion. Anyone who saw Nagasaki would suddenly realize that they'd been kept in the dark by the United States government as to what atomic bombs can do. Is the current threat to our civil liberties comparable to what you experienced in the early '50s? No, it's much worse. That was nothing back then. President Eisenhower's reign was very stultifying [inkompetent]; there was lots of unspoken censorship. But today, Eisenhower looks like an angel compared to these bandits who are now running Washington. They're criminals; they're international criminals. Under both Bush administrations, they've reappointed [wieder eingesetzt] at least four felons [Schwerverbrecher] who were convicted [verurteilt] during the Watergate years and during Iran-Contra. They're in government now. These are international criminals, and the spineless Democrats are doing nothing about it. Way back when, did you expect trouble when you published Howl? Of course. It seemed the clamor [Geschrei] was such that this book would not be allowed by proper society. After all, Howl was a vast [gewaltige] castigation [Geißelung] of American consumer society. Did you anticipate any sort of Supreme Court intervention? Well, I doubted that it would get to the Supreme Court, but as long as we had the American Civil Liberties Union to back us up, we were ready to go to the Supreme Court. Of course, without the ACLU we'd have been out of business. We were just a one-room bookstore; we didn't have any money for lawyers. It would have been nice had we provided a nice warm stable [Stall] and we were feeding them regularly - the care and feeding of poets. The care and feeding of authors is what publishers do. We didn't really have a stable. One at a time, poets would stagger [taumeln] in the door, drunk or sober [nüchtern], high or stoned. They were looking for a stable, but we didn't have one. In fact, we weren't very stable ourselves. We were a two-bit [unbedeutend], one-room bookstore with no money. That's how it was. How do you envision the future of publishing? E-books? The future of publishing lies with the small and medium-sized presses, because the big publishers in New York are all part of huge conglomerates. The real literary editors have mostly been fired. Those that remain are all "bottom line" [gewinnorientiert] editors; everything depends on the money. New Directions, who's been my publisher since they published my book A Coney Island of the Mind> in 1958, is a rare exception. They were the first to report on and publish poets like Ezra Pound, Dylan Thomas, William Carlos Williams, Tennessee Williams - a huge list of important American, as well as European, writers. New Directions is still going strong [gut in Form sein], and they're still not a part of any corporate conglomerate. What can we do as individuals to stem the tide [Flut eindämmen?]? Don't patronize [unterstützen] the chain bookstores. Every time I see some author scheduled to read and sign his books at a chain bookstore, I feel like telling him he's stabbing the independent bookstores in the back. With their commercial tactics, they've wiped out about half the independent bookstores in the country. It's happened across the board [auf breiter Front] in major cities in the United States. For instance there's not a single independent bookstore left in downtown Chicago. There are hardly any left in New York City. The San Francisco Bay Area is very fortunate to still have a lot of independent bookstores. There's nowhere else in the country like this. What effect can poetry actually have these days? Make love not war. We have to raise the consciousness; the only way poets can change the world is to raise the consciousness of the general populace. Since 9/11, people are expecting intellectuals, especially writers, to articulate some new paradigm of reality to live by. Many of the poets in the high poetic positions have been singularly silent or, at best, come out with a low mumble [zurückhaltendes Gemurmel]. It's the unknowns who have come up with some great poetic statements. In your inaugural speech [Antrittsrede] as San Francisco's poet laureate [Preisträger] you mentioned some things you hoped to address: gentrification [Vertreibung der Armen durch Aufwertung von Grundstücken], "autogeddon," [Vermutlich die Vernichtung der Erde durch Autos] the Blue Angels [Navy Flugstaffeln? ], chain stores, painting the Golden Gate Bridge golden, and tilting [kippen] the Coit Tower [Aussichtsturm in San Francisco]. Well, I was up at the Coit Tower the other night, but there were two police squad cars parked there, so I didn't have a chance to tilt the tower. I'm still working on it. Look what it did for Pisa! And I was disappointed when I came out here and saw that it was a Navy red-lead [Mennige] color. That's what they put on ships before they paint the gray. It's anti-rust. Let's make it California-golden color. And the Blue Angels are coming back to scare [erschrecken] the local population. I remember seeing old Vietnamese women ducking under the benches in Washington Square; they thought they were back in the war. It's just a big militaristic, jingoistic [hurrapatriotisch] display of testosterone. Do you think it's possible to regenerate the "island mentality" you felt when you moved to San Francisco in 1950? I think if there's a great depression there might be some hope. Nothing's going to change in this country as long as everyone's so well fed. What it takes for a revolution is hunger and passion. There won't be any changes until we have another depression like in the 1930s, which we have not approached yet in the present recession. Which of your gallery exhibitions has been the most satisfying for you? I had a show at George Krevsky Gallery this past spring. That show traveled to Woodstock, New York where it showed for six weeks. It was a big show, about 20 large canvases [Leinwände]. It was called "lit.paint." Do you think your paintings communicate as effectively as your written works? The paintings may communicate even better because people are lazy and they can look at a painting with less effort than they can read a poem. There have been surveys that conclude that the average amount of time someone looks at one painting is 10 seconds. It's much easier to consume the visual image than to read something. From what I've read, your early paintings emulated [nachahmen] the Abstract Expressionists. Why have you shifted? Well, I didn't know how to draw very well back then, in the '40s and '50s. A lot of people who take up painting go right into doing non-objective or abstract, and they think that makes them artists. The famous non-objective artists, from the New York School, for instance - Kline, De Kooning, Motherwell - were Abstract Expressionists, but they were great draftsmen [Zeichner]; they could draw extremely well before they started painting non-objective. Did you become disenchanted [enttäuscht] with your own work? Would you like to write another novel? Well, yes, I've been writing one for quite a few years. It comes from a phrase in my first novel, Her, which was a Paris novel of the 1940s. It was a surrealist novel. It contains a phrase - "Fourth Person Singular." That's the title I'm using for the new novel. I have no idea if I'll ever finish it. I'm reading a book about Romaine Brooks, a wonderful painter from early in the last century. I'm also reading The Trials of Lenny Bruce, a great book on Lenny Bruce, who was what I call a "stand-up tragedian." I'm reading School for Dictators by Ignazio Silone, who was a famous Italian anti-Fascist writer in the '20s, '30s, and '40s. It's the story of an American who wants to become a dictator and goes to Europe with a sidekick [zusammen mit einem Kumpel] to interview various Fascists to find out how the Nazis and Mussolini got into power. They learn that they gained power with the complete cooperation of the existing democratic institutions. It's just what's happening here; it's what happened in Florida, which was a subversion [Umsturz] of the last presidential election. Then there was the complete cooperation of the Supreme Court, and now there is the complete cooperation of the Democrats and Republicans in Congress. Do you feel a growing need for poets and artists to become activists? Not necessarily. It really depends on the artist. Some of our greatest painters and poets are not activists at all. Like the Japanese haiku masters, or various Polish poets or Chinese poets, or 12th century mystics like Rumi or Hafiz, the great Persian poets. You can say they were dissident poets, but they weren't really activists. If certain artists aren't used to thinking politically, what they create won't measure up [hohe Qualität erreichen] anyway. If you could change anything at all about San Francisco, what would you change? I'd ban all automobiles from the central part of the city. You see, the automobile was just a passing fad [vorübergehender Trend, Wahn, Marotte]. It's got to go. It's got to go a long way from here [weit entfernt von hier].